NAJIB IS DEEMED / DE FACTO 1MDB DIRECTOR BY LAW. HAFARIZAM & ARUL KANDA TALK RUBBISH! As boot-lickers come and go, serially lying Malaysian PM Najib and BUMNO/SCUMNO have more than their fair share of them. But few come close to to the stupidity and incompetence of Najib's sycophantic lawyer Hafirizam Harun or 1MDB President and Chief Executive Managing Director Arul Kanda. The world now knows that another boot-licker, Hassan Arifin, the Chairman of the Public Accounts Committee (PAC) conspired with Najib to issue a statement that he was not involved in the affairs of 1MDB. No sooner was this statement made than it was revealed that under the Articles of Association of 1MDB, it could virtually do nothing without Najib's written approval. More than that, it was revealed that since 2009, Najib had in fact signed numerous resolutions and letters and guarantees authorising 1MDB to raise billions of ringgit of loans and plough it into "investments". Now, we must also keep in mind at all times that Prime Minister Najib is the man who started 1MDB. He has been both Finance Minister AND Chairman of the Advisory Board of 1MDB from the very beginning in 2009. Given these facts, there was no way that Najib was not involved in 1MDB's affairs and that the buck did not stop at his desk! SEE PICTURE BELOW. Furthermore, under Section 4(1) of the Companies Act 1967, a director is a person who is formally appointed as such, or, regardless of whether he is appointed so or not, is one from whom the Chairman, Board of Directors and top management are used to taking and acting upon instructions from. Thus, Najib is considered a deemed director or de facto director of 1MDB. Corporate history all over the world is familiar with bankrupts or criminals continuing to run companies by remaining in the shadows, while their wives or children or nominees act as fronts in the operations. So, whichever way we look at it, Najib is involved up to his eyeballs in the affairs of 1MDB. 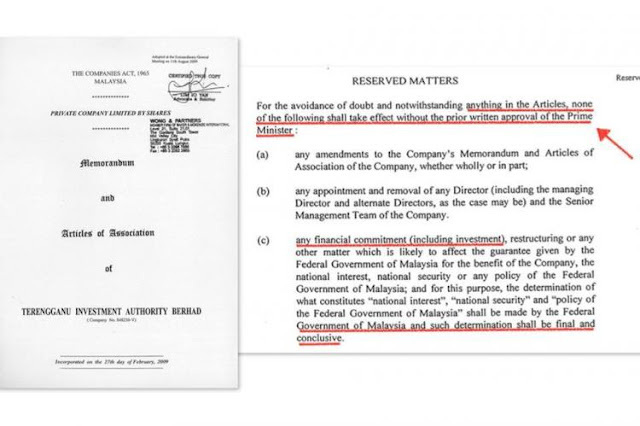 When the news of Najib having signed numerous 1MDB resolutions and documents came to light, quick as a flash, his boot-licking lawyer Hafarizam came up with the statement that basically Najib had signed the documents blindly, and therefore all the fault lay with 1MDB's board of directors and management! Huh! The prime minister's lawyer who had served so many years as a Deputy Public Prosecutor with the Attorney Generals Office does not know that a person's signature on any legal document is prima facie evidence that he has read its contents, and that it's up to him to prove otherwise? That ignorance of the law is no defence, especially for a prime minister who has the entire machinery of government to advise him before he signs anything? Also, when questioned by Channel NewsAsia why Najib had yet to sue the WSJ, Hafarizam not only showed his ignorance of national and international laws, but he also resorted to racism and false patriotism to deflect Najib's now exposed looting of at least RM4.2 billion of 1MDB's funds for his personal gain. CLICK HERE AND ON VIDEO BELOW. I am no lawyer, but the law is not that complicated on this subject. Any citizen or foreigner who commits a crime in a country is liable for prosecution in that country. In the event that the alleged criminal is a foreigner who has returned to his home country, the prosecuting country can only ask him to return voluntarily to face charges, or apply for extradition. 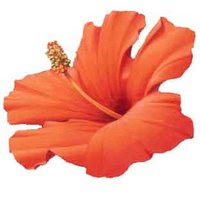 Extradition can only succeed if there is a treaty between the two countries AND the offence is an extraditable offence. In Najib's case, investigations are going on in Switzerland, USA, Hong Kong, Singapore, Germany and Luxembourg for offences ranging from money-laundering to outright fraud, all committed in those countries. He can be extradited to face the music if the prosecutors there feel they have a good case and there is an extradition treaty between the and Malaysia. So, why was Hafarizam waffling like an amateur and deliberately being thick? Firstly, in 2009, Hafarizam and ex-Chief Justice Zaki were responsible for allowing an elected state government in Perak to be replaced by BUMNO/SCUMNO through the back-door, as it were. CLICK HERE. Najib was of course pulling the strings from the shadows. Then Hafarizam and Zaki's wife won the Federal Government's RM2.2 billion price-inflated KIDEX toll highway contract. CLICK HERE. There is no doubt that between them, they would not know how to lay two stones together side by side, let alone handle anything as technical and complicated as constructing a toll highway. Unfortunately for them, the Selangor state government cancelled their approval for the contract in 2015, as KIDEX had not complied with several of their pre-contractual conditions such as the requirements to hold proper public inquiries and conduct unbiased traffic studies. At RM161 million per kilometer, KIDEX would have been the most expensive highway in Malaysian history, including its concession period of an unheard 48 years!! That explains why Hafarizam is still defending the indefensible and sucking up to Najib, doesn't it? Hafarizam then insulted the WSJ and other foreign news organizations with a racist remark by saying that their exposes on Najib's massive criminality was tantamount to attempted re-colonization of Malaysia by the Americans, the British and the whites! So, what should Malaysia's attempts to prosecute Justo or Clare Rewcastle-Brown be seen as? Revenge against the whites by a brown? And when exactly was it that the USA colonize Malaysia? Not to be outdone, in came Arul Kanda, 1MDB's President, right on cue. Concrete proof has now been produced that about US$4.2 billion or RM17 billion had been fraudulently diverted from 1MDB on Najib's instructions, for his personal gain. RM14 billion was diverted from 1MDB to off-shore companies headed by Abu Dhabi Aabar Plc Chairman Khadem Al Quabaisi and his CEO, Mohamed Bawady Al-Husseiny. These off-shore companies had names very similar to Aabar companies so much so that Malaysian auditors appear to have been fooled by them. RM3 billion (US$700 million) was transferred to Najib-crony and 1MDB investment advisor Low Taek Jho of Good Star Ltd. incorporated in the Seychelles. All three have repeatedly denied their criminality despite having been exposed by Sarawak Report and the WSJ. Chairman Hassan Arifin refused to summon them to testify at PAC hearings. When Arul Kanda was questioned, his answers now published for public consumption reveal that he was pretending not to understand questions put to him or playing around with words. Now that the real Aabar's parent company IPIC in Abu Dhabi has made an announcement to the London Stock Exchange that they never received the RM14 billion, Arul Kanda suddenly thinks that 1MDB could have been the VICTIM of a fraud!!?? 1MDB was not the victim of fraud, it was the perpetrator! But that there was fraud is exactly what Sarawak Report, Tony Pua, myself and a few others have been saying since 2013. Yet, when Arul Kanda took over as CEO in January 2015, he did nothing to get the books audited for fraud! It is not 1MDB that was defrauded, but the PEOPLE of Malaysia. The fact is this fraud involving RM17 billion must have been committed by Najib with the tacit assistance of the Chairman and of some of the directors, if not all, and the top-management of 1MDB such as Sharol Azlrul Helmy. This is obvious since Najib had to sign off on these massive bank transfers and another RM4.2 billion of "donation" more that made its way to his personal bank account in Malaysia. The hole in 1MDB's balance sheet is therefore between RM20-30 billion, plus another RM4 billion of loan from KWAP utilised in dodgy Mongolian/Indon coalmine venture investments and subsequently transferred to MoF by Najib's orders. So, Hafarizam, Arul Kanda and everyone else at 1MDB and the Cabinet can continue lying and covering-up for Najib and themselves, but the exact amount of money misappropriated, misused and swiped by 1MDB Chairman, directors and top executives, Najib and his government of thieves will be ascertained soon, for the world to gasp at! 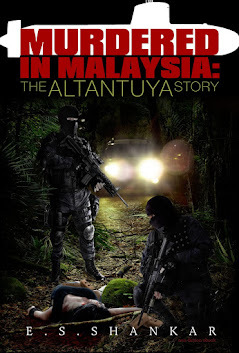 This is surely the heist and crime of the century in Malaysian if not world history! And note too, the similarity in modus operandi of Najib, the police and Attorney General in the murders of Altantuya (2006) and Hussein Najadi (2013) and Kevin Morais (2015) and in the investigation of 1MDB. The PAC finally only recommended that Shahrol Azrul Helmy of 1MDB be charged for a crime, but refused to name Najib as the main person who should be prosecuted. In the two murder cases, till to-day the police have refused to investigate to identify and charge the mastermind who gave the orders to kill. Najib has the touch of the plague about him; whatever he touches withers, goes rotten and dies!! Donplaypuks® with boot-licking and brown-tongueing, man! AUDITOR GENERAL'S 1MDB REPORT NAMES NAJIB AS MAIN CRIMINAL! CLUELESS SERIGAR ABDULLAH NEXT BANK NEGARA GOVERNOR? No, the Auditor General's 1MDB Report has not been leaked to me, yet. It is still locked up and access blocked from the Rakyat (citizens) under the Official Secrets Act (OSA) by a dark and dirty conspiracy involving serially lying, defrauding, looting, plundering and possibly murdering Najib, Attorney General Pandi and Speaker Pandi. But, my stance is that if the Prime Minister and his party and government of thieves can serially lie, abuse their Constitutional powers, and fling all considerations of ethics, morals, honour and integrity into the drain, why should I play fair and stick to the Marquess of Queensbury rules? CLICK HERE. So, I shall rely on common sense. If there was nothing incriminating in the Auditor General's 1MDB Report about Najib's criminal conduct in defrauding and looting 1MDB, why would anyone block access to it by classifying it under the OSA? More than that, the normal procedure is for the Auditor General to tender his report to Parliament. Having done this, it is Unconstitutional for Najib and the Pandi & Pandi duo to classify it under the OSA. Anyway, I have been reliably told that the Auditor General does in fact name Najib as having committed fraud, CBT, misappropriation of funds, abuse of power, breach of fiduciary duty, criminal malfeasance, money-laundering, looting, plundering, obstruction of justice and lying about money raised by 1MDB as loans and guaranteed by the government. That is to say RM46 billion of loans, of which RM4 billion borrowed from government pension fund KWAP that was transferred to MoF on Najib's orders, when it became clear that the money had been fraudulently diverted by Najib for his own use and benefit. Nevertheless, this RM4 billion too has to be repaid to KWAP from the Rakyat's pockets! 1MDB President Arul Kanda has also publicly confirmed that RM18 billion paid by 1MDB to Malaysian tycoon Ananda Krishnan for IPPs, was inflated. This is a clear admission of fraud and criminal act of possibly, about RM4 billion. Where did this RM4 billion disappear to? If that's not enough to send Najib to prison for the rest of his life with no remission, then I do not know what is. 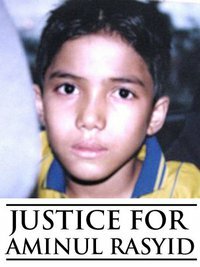 Three murders have also revolved around Najib for which the gallows may well be awaiting him - Altantuya, Hussein Najadi and Kevin Morais. CLICK HERE. And all those who have helped Najib cover-up this crime and heist of the century, (CLICK HERE AND STUDY THE PICTURE) including Public Accounts Committee (PAC) Chairman 'Cari Makan' Hassan Arifin and 1MDB President Arul Kanda, should join him in adjacent cells in Bamboo River Resort (Sg. Buloh Prison).! Now we come to Mohamad Irwan Serigar bin Abdullah, Chief Secretary to the Ministry of Finance and possessor of a PhD in Economics from the International Islamic University of Malaysia. He also did an advanced Harvard management program in 2008. CLICK HERE. He is a career civil serpent who has risen up the ranks since 1984. He sits as advisor or director (e.g Bank Negara, Felda GV, Khazanah) at dozens of GLCs where the MOF has control. He is an advisor, as is Chief Secretary to the Government, Ali Hamsa, to 1MDB where PM & Finance Minister Najib is the Chairman of the Board of Advisors. The minutes of the relevant PAC hearing were made public, after the whitewashed PAC Report on 1MDB was released on 7 April 2016. What emerged, is, to say the least, astounding. It seriously calls into question Serigar's integrity and academic qualifications, government service experience and intelligence. "The Advisory Board never met. We don't know. We read about it in the newspapers. We were side-lined'!!!??? CLICK HERE. 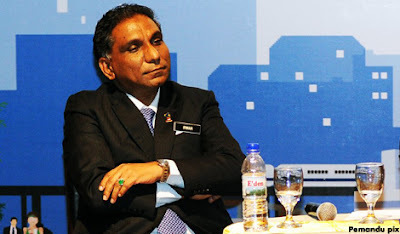 The Chief Secretary to the MoF, a man who has spent 32 years in the civil service, did not know about 1MDB's $46 billion borrowings and fraud there? Remember, 1MDB is a 100% subsidiary of the MOF. It needed MoF and Treasury approvals to borrow all that $46 billion, and the MoF did issue guarantees and letters of support for 1MDB to borrow that stupendous sum of money. PM AND Finance Minister Najib was Serigar's boss whom he must have met every day when 1MDB was borrowing money like it was going out of fashion. They both sit on the Board of Advisors of 1MDB as does Chief Secretary Ali Hamsa. Yet, he has the gall to openly lie at the PAC hearing that he did not know what was going on, Is that how a PhD holder who has done a stint at Harvard manages his portfolio of work? Is that how the top man at the MoF, the Chief Secretary, prioritises his work in a RM46 billion investment - by waiting to read about developments in the newspapers? The mind boggles! It never occurred to Serigar to ask Najib or the directors about their financial affairs and status? He never asked for quarterly management financial statements and scrutinise them? All these top civil serpents and 1MDB executives like Arul Kanda went to the PAC inquiry with the deliberate intent of appearing to be stupid and obstruct and cover up for Najib and the $46 billion fraud at 1MDB. That's for sure as the sun will rise in the East tomorrow morning. However, if that is remotely not the case, God help us, because there must be dozens more of billion ringgit projects under the MoF that Serigar has been neglecting, and more malfeasance and fraud waiting to explode in our face! God help us too if the Wall St. Journal is right that Najib has ear-marked Serigar to succeed Zeti as the next Governor of BNM!! 1. Nor Mohamed Yakcop is the Minister in charge of the EPU (Economic Plundering Unit) and Deputy Chairman of Khazanah, the government's investment arm. But of course, Nor was sacked from Bank Negara Malaysia (BNM) in the early 1990's for being the principal forex trader whose actions nearly bankrupted Malaysia. Then PM Mahathir first lied about BNM's forex losses, but was caught out by DAP's Lim Kit Siang who astutely spotted a RM6 billion hole in BNM's balance sheet. Eventually, it transpired that the actual losses were in the region of RM30 billion, which Mahathir and BNM illegally hid by revaluing gold and other assets! CLICK HERE. 2. Sidek Hassan, ex-Government Chief Secretary. Before retirement, he tried to ram through a budget proposal whereby his salary and that of top civil serpents would be double that of the prime minister and ministers! Najib stopped just short of sacking him. CLICK HERE. Yet today, Sidek is also Chairman of Petronas!! What hold does he have on Najib, for God's sake? I am positive that if these two were to be questioned about 1MDB, they too would say they knew nothing about it, or for that matter, if a great fraud were to be discovered at the EPU, Khazanah or Petronas. Such is the incompetence, shameful and disgraceful attitude and criminal conduct of many of Najib's top appointees to the civil service and GLCs! They are paid fabulous salaries and perks from the Rakyat's hard, hard earned money, yet go about their jobs without any sense of understanding or responsibility, while the looting and plundering continues unabated all around them. The truth is, most of them are responsible for and participate in the looting and plundering themselves. 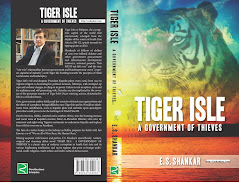 When we have removed Najib and his government and administration of thieves from office soon, we must also book places in Bamboo River Resort for all these thieving civil serpents and also restructure the entire civil service, so that this system of corrupt patronage will no longer be possible! Donplaypuks® with saying you were not consulted or don't know what happened when you are paid fabulously to do a good job, Najib, Lodin Wok, Ali Hamsa, Serigar, Yakcop and Sidek. We are coming after you with both barrels loaded! SERIALLY LYING PM NAJIB ENGINEERS WHITEWASH OF 1MDB PAC REPORT, CARI MAKAN CHAIRMAN HASAN ARIFIN BENDS OVER! Let me state at the very beginning that it is impossible for serially lying, defrauding, money-laundering, looting and plundering Prime Minister (PM) Najib not to have been directly involved in every aspect of the running of 1MDB and its operations, acquisitions, disposals and RM46 billion borrowings, and now confirmed RM50 billion debt as at 31 January 2016. It was Najib who ordered the winding up of the Terenggau Investment Authority (TIA) to set up 1MDB under the control of the Ministry of Finance (MoF). The MoF is the sole (100%) shareholder of 1MDB with a last known paid up share capital of RM1 million vs audited loans of RM46 billion. PM Najib is also the Finance Minister. Ultimately therefore, in anything connected with 1MDB and the MoF, the buck stops with Najib. CLICK HERE. More than that, no appointment to the Board of Directors of 1MDB, including its Chairman and CEO and its Board of Advisors, could have been made without Najib's approval. These are all stated the Articles of Association of the company. To cap it all, Najib is also the Chairman of 1MDB's Board of Advisors. He is also the person who put together 1MDB and Jho Low who made several investments running into billions of ringgit on behalf of it. It is principally these billions of ringgit that are at the heart of 1MDB's missing RM25-30 billion of funds. The WSJ and Sarawak Report have also reported that Jho Low siphoned out much of this money for his own side-deals, which constitute Criminal Breach of Trust, fraud and International money-laundering. In short, nothing major could have moved in 1MDB without PM Najib signing off the orders! It was obvious to everyone in Malaysia that when Najib "promoted" Nur Jazlan (to Deputy Home Minister) from the Chairmanship of the Public Accounts Committee (PAC) and replaced him with his stooge Hasan Arfifn last August, the eventual PAC report on 1MDB would be a chunam (whitewash) job to clear Najib of any involvement in the $46 billion fraud at 1MDB, and keep the fall-out to a minion like CEO Sharul Azral. Hasan Arifin, when asked about his job last year, said he was only 'Cari Makan' meaning scratching for a living, a clear indication that he hasn't a clue about his job or its importance. 1MDB, its repulsive President Arul Kanda and the PAC now claim that as the RM46 billion of loans have been "accounted for" in 1MDB's balance sheet, accusations of the missing billions of ringgit are unfounded, and by extension, Najib absolved of any fraud. But, this begs the question why Najib sacked two chartered accountant audit firms, and 1MDB's 2015 audited financial statements have now been delayed for a staggering 12 months. This "accounted for" is the typical language of the world's great con men. Enron's CEO also said that before its spectacular collapse. You give your son Arul Kaunda Kundi $20 to buy some school stuff and he returns with two pencils. When you ask him what happened to the change, he writes down a list of items, but there is not a single receipt as proof. Of course he thought you would trust him and not ask for receipts, especially since he used most of the money to buy a packet of cigarettes! So, technically, he has "accounted for" the $20. When pressed, he gives you an IOU signed by his good friend Jho Paris Hilton. The IOU is not worth the paper it's written on, since the money has already gone up in smoke. And that is exactly the case with 1MDB. Of the RM46 billion loans raised by 1MDB, RM4 billion from government pension fund KWAP was purportedly invested in a Mongolian coal-mining company. When questioned, 1MDB panicked and Najib transferred the entire "investment" to a MoF 100% subsidiary, SRC. Investigations show that only some $400 million was invested in the Mongolian coal-mine. So, what happened to the balance of RM3.6 billion? SRC's answer was that the RM4 billion has been fully "accounted for" in its balance sheet, but, hiding behind the Official Secrets Act (OSA), it refuses to provide details of the full investment or its current market value. Does anyone suspect fraud? Does Dracula crave for fresh blood? This is also the case with the balance of 1MDB's RM42 billion borrowings. Of this, RM18 billion was utilised by 1MDB to invest in IPPs. Now, 1MDB President has publicly confirmed that the price tag was deliberately inflated to RM18 billion "to reduce future tariff increases by Tenaga"?? A more shameful and ludicrous statement could not have come from 1MDB's office boy. Two audit firms were sacked by Najib when they asked for proof and current market valuations of the investments made. All they have are pieces of IOUs and letters from Jho Low and others. When questioned about US$2.1 billion said to have been transferred to a Singapore bank, 1MDB's Arul Kanda first said he had seen the cash. When WSJ exposed the fraudulent story about the cash, Arul and the con-men at 1MDB swiftly back-tracked and came up with a disgraceful lie that the investment was in 'units". Units of what? OSA! Najib and Arul Kanda are flogging off 1MDB's key assets like the Ipps and land, to cover up the hole in the balance sheet created by the missing RM25-30 billion. They are basically saying to us that as long as the hole is plugged, questions about the $25-30 billion fraud and corruption should not be raised!! If we allow them to get away with it, we will be giving a free licence to every top person in government and private and public corporations to loot and plunder as they please!! The PAC report clearly states their inquiry was thwarted by the failure of 1MDB to produce concrete proof that its $42 billion had been properly invested. All they have been submitting to nervous auditors are verbal assurances, dubious pieces of letters from Jho, IOUs and "units' not backed up by proper investment certificates and valuation reports. Arul Kanda blocked all PAC access to the accounting records and bank statements of 1MDB's overseas off-shore subsidiaries. Yet, Najib and his entire government of thieves are now trumpeting all over the country that Najib has been cleared of any complicity in the failings of 1MDB, and that billions of ringgit are not missing - that it has all been "accounted for"!! The fall guy for all the billions of ringgit of looting is 1MDB CEO Sharol Azrul who immediately proclaimed "I did nothing wrong". Reading between, the lines, this means he was following Najib's and others' orders, so why should he be the one to go to jail? He seems to be echoing Colonel Nathan Jessup's words in that brilliant movie 'A Few Good Men' - "We follow (Najib's) orders or men die!". Shahrol also does not seem to understand the Nuremburg Principle - No one is obliged to follow illegal or criminal orders! The PAC report also clearly identifies instances where Shahrol and his team over-rode company policies and disbursed funds, billions of ringgit, without proper authorisation or approval. Yet the men at 1MDB have been claiming all this time that nothing illegal or untoward had happened at 1MDB. The entire management at 1MDB (except those who resigned as a matter of principle) - Najib, the advisors, Chairman Lodin Wok, all past and present CEOs, Chief Secretary to the government Ali Hamsa and MoF Chief Secretary Serigar Abdullah, etc. - are guilty of criminal malfeasance, dereliction of duty of care (fiduciary duty) and of covering up all the illegalities. It is not beyond the pale that besides Najib, some of the executives and directors are guilty of corruption and accepting illegal inducements and bribes. The Cari Makan PAC boss Hasan Arifin also stymied all efforts by its members like DAP MP Tony Pua from summoning Najib, Bank Negara Governor Zeti and Jho Low and grilling them. Zeti is of course concealing the truth about the RM4.2 billion that flowed through Najib's personal bank account. These illegal money-laundering bank transfers took place between 2011-2014, and yet Zeti waffled about "looking into it"!! Najib also stupidly claimed that RM2.6 billion of that money was a "donation" from some unknown Saudi royalty. This is about as credible as as saying that pigs can fly. Much of that money was used by Najib to buy votes and rig the last General Election. RM2.06 billion of it has still not been satisfactorily accounted for by Najib. AG Apandi claimed it was TT'd overseas, but no one else has seen or heard of those funds. In the end, even if Najib manages to defy the will of the people and not resign, he cannot escape the fall-out that will result from criminal investigations of 1MDB going on now in the US, Switzerland, HK, Singapore, Luxembourg etc. Najib and his government of thieves are threatening ISA and Sedition charges against anyone who raises the 1MDB issue against him, on the ground that he has been cleared by the PAC. But, as Tony Pua said, it's more a case of the PAC failing to clear his involvement and innocence. All this sabre-rattling may be to appease the restless natives and those living in the boondocks. But it's not going to fool anyone else here or around the globe. Rumour hath it that the Auditor General's report on 1MDB names Najib as a criminal. Little wonder it's been Unconstitutionally classified under the OSA. But the ultimate lie told by Najib from which he cannot escape is about the RM42 million transferred to his bank account by SRC, and utilised by him to buy diamonds (RM3 million) for Rosmah and other expenses for cars, holidays and luxury items. There were also payments of RM2 million to Deputy Minister Ahmad Maslan and RM1 million to UMNO party chief Shahrir Abdul Samad. The full list has yet to emerge, but Najib sycophants like Minister Azalina Othman, Rahman Dahlan and Salleh Syed Keruak may well have been the beneficiaries of his 'largesse" from this fictitious "donation". RM55 million was paid to local fabric retailer Jakel. Najib claims they sourced carpets and clothes from Jakel for charitable purposes. Another blatant lie! When there is a government Welfare Department which can source donation materials for free from the general public and corporations, who in their right frame of mind would source goods from a retailer for charities and pay RM55 million for it? The obvious question everyone is asking is, who really owns Jakel - Najib and Rosmah? Najib still unashamedly claims that he did not know about the RM42 million in his bank account and did not instruct SRC to transfer the money either. SRC, sticking to the script, also claims it does not know who gave instructions to transfer the RM42 million to Najib's personal bank account!! It has not escaped anyone's attention that SRC CEO Nik Faisal Ariff Kamil has disappeared on Najib's instructions to Indonesia! It's a simple matter is it not? It would take all of 15 minutes for Governor Zeti of BNM to to get to the bottom of it all. Yet, it would appear that Zeti and BNM have not lifted a finger to clear the mystery of who tansferred what on whose instructions. It would clearly suggest that Zeti is covering up for Najib. In any event, how could Najib claim to be unaware of the RM42 million when he issued cheques and payments orders favouring his wife, Cabinet and party members against that huge amount of money? So, one lie leads to another and another! Three murders have also revolved around Najib. CLICK HERE. What we have under Najib is clearly a rogue and criminal regime that has no legal or moral authority whatsoever to stay in office. So, we have a gallery of traitors, many of whom have yet to be identified, who are our enemies from within. I am not intimidated by Najib or his sycophants' threats of ISA, OSA, Sedition Act and the like. Bring it on Najib, I'll see you in court. And if anyone should leak to me a copy of the OSA'd Auditor General's Report on 1MDB, I will publish it here at my blog!! It is the duty of every right thinking citizen to help unseat this evil regime, which ultimately cheats the Malays most and tarnishes their name internationally. Donplaypuks® with staying in office Najib and your government of thieves. Resign today! OPPOSITION DEFIES PIG CHICKEN KEBAB51, MARCHES ON PEACE HILL IN SUPPORT OF PKR MP RAFIZI RAMLI! 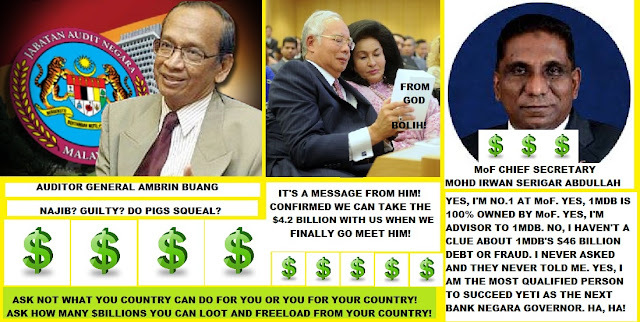 We have now in Malaysia, a serially lying and defrauding, looting, plundering, international money-laundering and possibly murdering prime minister, Najib Razak, who is on the threshold of becoming a dictator, supported by a government of thieves whose politicians and civil serpents have illegally received "gifts" of moneys stolen by Najib from public coffers. Then there are charges of abuse of power, lying and obstruction of justice he has to answer for too, not to mention unaccounted for extravagant spending of millions of ringgit by his wife Rosmah. That Najib is able to defy the will of the PEOPLE and still remain in office, is due almost entirely to the unstinting loyalty he gets from Police Inspector General (PIG) Khalid Abu Bakar, and Attorney General Apandi Ali. PIG Khalid has the twitter name of @KBAB51; a most appropriate hashtag for a coward to be nickname Chicken Kebab51. Have no doubt, only the PIG and AG Apandi stand between Najib and a prison cell. If Stalin had his Beria, and Hitler his Himmler, homicidal psychopaths to do all their thuggish work, then Najib has Chicken Kebab51 to do his every bidding. Thus far, with Chicken Kebab51 and Apandi's aid, Najib has managed to sack DPM Muhyiddin, ex-AG Gani Patail and disrupt Bank Negara Malaysia, MACC and PAC inquiries into the heist of the century - i.e. Najib's looting of 1MDB to the tune of at least RM4.2 billion, while another RM20-25 billion is unaccounted for. Yesterday, like a buffoon, the hectoring and bullying and cowardly PIG Chicken Kebab51 warned the Opposition about marching on his police HQ at Bukit Aman (Peace Hill) in public protest against the arrest and totally unnecessarily three-day remand of Opposition and PKR politician, Rafizi Ramli. Rafizi's "crime" was that he had purportedly leaked documents classified under the OSA (Official Secrets Act) relating to late payment of gratuities to armed forces retirees. Rafizi is also facing another charge under the Sedition Act. CLICK HERE. Today, Opposition MPs defied PIG Chicken Kebab51's threats, and marched on Peace Hill. Bravo! Good for them. They are finally starting to show some real balls. As for PIG Chicken Kebab51, justifiably, he has become the worst and most hated IGP in Malaysian history. His double standards have now been universally recognized. He is able to act with blinding speed where the Opposition is concerned, while crawling at snail's pace and then turning a blind eye to the most abominable racist acts, religious bigotry, utterances and crimes committed by members of the ruling party. While the whole world is now investigating Najib's international thievery, the IGP has yet to take a step forward locally. He intimidated BNM and MACC officers to help Najib deliberately disrupt a Task Force's investigations into his looting and CBT. We know now how the game is to be played. But, he can't arrest them all. So, the end-game will be, we shall soon see Najib sharing a cell with PIG Chicken Kebab51 and AG Apandi Ali in Sg. Buloh Prison (dubbed Bamboo River Resort)! Have no doubt at all that this will come to pass, soon! Donplaypuks® being a henchman, goon and thug for criminal PM Najib, PIG Chicken Kebab51! !